The 2016 New York Jets season is the franchise's 47th season in the National Football League, the 57th overall and the second under head coach Todd Bowles. The team failed to improve on their 10-6 record in 2015. Special teams coordinator Bobby April, special teams assistant coach Steve Hagen and assistant offensive line coach Ron Heller were fired on January 6, 2016. Brant Boyer was named the special teams coordinator on February 3, 2016. Jeff Hammerschmidt was named assistant special teams coach on February 5, 2016. David Diaz-Infante was named assistant offensive line coach, Tim Atkins was named defensive quality control coach and John Scott, Jr. was promoted to assistant defensive line coach on February 9, 2016. The Jets signed Joseph Anderson, Deion Barnes, Brandon Bostick, Jarvis Harrison, Julian Howsare, Wes Saxton, Kevin Short, Deon Simon, Julian Stanford to reserve/future contracts on January 5, 2016. The Jets signed Kendall James to a reserve/future contract on January 7, 2016. The Jets signed Lawrence Okoye, Jesse Davis, Adrien Robinson, and Craig Watts to reserve/future contracts on January 11, 2016. The Jets signed Chandler Worthy to a reserve/future contract on January 12, 2016. The Jets signed Sean Hickey and Dominique Williams to reserve/future contracts on January 19, 2016. The Jets signed Titus Davis to a reserve/future contract on January 28, 2016. The Jets signed Dri Archer to a reserve/future contract on February 3, 2016. The Jets signed Kyle Brindza to a reserve/future contract on February 5, 2016. The Jets signed Freddie Bishop III on February 16, 2016. The Jets signed Matt Forte and Khiry Robinson on March 10, 2016. The Jets signed Steve McLendon on March 21, 2016. The Jets signed Darryl Morris on March 25, 2016. The Jets signed Jarvis Jenkins on March 30, 2016. The Jets signed Jeremy Ross on April 8, 2016. The Jets signed Luke Marquardt on April 20, 2016. The Jets signed undrafted free agents Robby Anderson, Tarow Barney, Quenton Bundrage, Kyle Friend, Tom Hackett, Jalin Marshall, Ross Martin, Helva Matungulu, Doug Middleton, Julien Obioha, Claude Pelon, Lawrence Thomas and Jason Vander Laan on May 5, 2016. The Jets signed Bryson Keeton and claimed Jerome Cunningham off waivers on May 9, 2016. The Jets signed Romar Morris on May 24, 2016. The Jets signed Shelby Harris on June 1, 2016. The Jets signed Mike Liedtke on June 2, 2016. The Jets signed Kyle Williams on June 17, 2016. The Jets signed Bernard Pierce on July 27, 2016. The Jets signed Terry Williams on August 3, 2016. The Jets signed Matthew Tucker on August 4, 2016. The Jets claimed Chris King off waivers on August 6, 2016. The Jets signed Anthony Kelly and Christo Bilukidi on August 8, 2016. The Jets re-signed Julien Obioha and placed him on injured reserve on August 10, 2016. The Jets signed Lache Seastrunk on August 13, 2016. The Jets signed Terry Williams and Jake Ceresna on August 14, 2016. The Jets signed Antone Smith on August 16, 2016. The Jets claimed Braedon Bowman, Brian Parker, Troymaine Pope and Darryl Roberts off waivers on September 4, 2016. The Jets signed Antonio Allen on September 6, 2016. The Jets signed Braedon Bowman on September 23, 2016. The Jets waived Kyle Brindza on February 18, 2016. The Jets released Antonio Cromartie on February 22, 2016. The Jets released Jeremy Kerley and Jeff Cumberland on March 9, 2016. The Jets waived Sean Hickey on May 7, 2016. The Jets waived Adrien Robinson and Dri Archer on May 9, 2016. The Jets waived Jerome Cunningham on Mary 24, 2016. The Jets waived Lawrence Okoye on June 1, 2016. The Jets waived Luke Marquardt on June 2, 2016. The Jets waived Quenton Bundrage on June 17, 2016. The Jets waived Zac Stacy on July 27, 2016. The Jets waived Tom Hackett on July 28, 2016. The Jets waived/injured Kendall James on August 3, 2016. The Jets waived Terry Williams on August 4, 2016. Titus Davis left the team on August 6, 2016. The Jets waived/injured Julien Obioha and placed Chris King on the reserve/did not report list on August 8, 2016. The Jets waived/injured Matthew Tucker on August 13, 2016. The Jets waived Anthony Kelly and Christo Bilukidi left the team on August 14, 2016. The Jets placed Bernard Pierce on injured reserve on August 16, 2016. Pierce was released from the reserve list on August 20, 2016. The Jets released Deion Barnes, Jesse Davis, Kyle Friend, Shelby Harris, Jarvis Harrison, Ross Martin, Helva Matungulu, Lache Seastrunk, Jason Vander Laan, Kyle Williams and Terry Williams on August 28, 2016. The Jets waived/injured Dion Bailey, Jake Ceresna and Romar Morris on August 30, 2016. The Jets released Jeremy Ross and Antone Smith, waived/injured Trevor Reilly and waived Jace Amaro, Tarow Barney, Freddie Bishop III, Tommy Bohanon, Taiwan Jones, Bryson Keeton, Mike Liedtke, Doug Middleton, Dee Milliner, Darryl Morris, Claude Pelon, Wes Saxton, Kevin Short, Zach Sudfeld, Kenbrell Thompkins, Craig Watts and Chandler Worthy on September 3, 2016. The Jets waived Ronald Martin, Dexter McDougle and Dominique Williams and waived/injured Khiry Robinson on September 4, 2016. The Jets released Matthew Tucker and Trevor Reilly from their injured reserve list and waived Brian Parker from the active roster after he failed his physical on September 6, 2016. The Jets waived Braedon Bowman on September 13, 2016. The Jets waived Julian Howsare on September 22, 2016. The Denver Broncos traded Ryan Clady and their seventh round selection in the 2016 NFL Draft for the Jets' fifth round selection in the 2016 draft on April 10, 2016. The Jets signed Craig Watts, Claude Pelon, Myles White, Freddie Bishop III, Bryson Keeton and Doug Middleton on September 4, 2016. The Jets signed Dexter McDougle, Ronald Martin, Dominique Williams and Raheem Mostert on September 6, 2016. The Jets signed Victor Ochi and Wendall Williams on September 12, 2016. The Jets signed Braedon Bowman on September 19, 2016. The Jets signed Julian Howsare on September 24, 2016. The Jets waived Raheem Mostert and Myles White on September 12, 2016. The Jets waived Claude Pelon on September 19, 2016. RFA: Restricted free agent, UFA: Unrestricted free agent, ERFA: Exclusive rights free agent, FT: Franchise tag. The * denotes that the "2016 team" is the team that signed a player first after departing the Jets. It does not take into account additional transactions that may occur through the season. Traded to the Denver Broncos for Ryan Clady. Traded to the Houston Texans for Ryan Fitzpatrick. Lachlan Edwards P Sam Houston State From the Denver Broncos. The Jets traded their fifth-round selection to the Denver Broncos in exchange for Denver's seventh-round selection and offensive tackle Ryan Clady. The Jets traded their seventh-round selection to the Houston Texans in exchange for quarterback Ryan Fitzpatrick; the selection was upgraded to a sixth-rounder as a result of Fitzpatrick's playing time with the Jets in 2015. The Jets traded their 2017 fourth-round selection to the Washington Redskins in exchange for their 2016 fifth-round selection, which they used to select Brandon Shell. † Indicates the game will be simulcast on WABC-TV. Assistant Defensive Line – John Scott Jr.
NYJ – Nick Folk 28-yard field goal, 6:41. Jets 3–0. Drive: 15 plays, 65 yards, 8:19. BUF – Marquise Goodwin 84-yard pass from Tyrod Taylor (Dan Carpenter kick), 5:16. Bills 7–3. Drive: 3 plays, 82 yards, 1:25. NYJ – Nick Folk 29-yard field goal, 0:00. Bills 7–6. Drive: 9 plays, 75 yards, 5:16. NYJ – Matt Forte 1-yard run (Nick Folk kick), 11:07. Jets 13–7. Drive: 6 plays, 66 yards, 2:15. NYJ – Eric Decker 5-yard pass from Ryan Fitzpatrick (Nick Folk kick), 3:53. Jets 20–7. Drive: 7 plays, 77 yards, 3:54. BUF – Dan Carpenter 39-yard field goal, 0:05. Jets 20–10. Drive: 13 plays, 54 yards, 3:48. BUF – Greg Salas 71-yard pass from Tyrod Taylor (Dan Carpenter kick), 14:09. Jets 20–17. Drive: 3 plays, 75 yards, 0:51. BUF – Nickell Robey-Coleman 36-yard fumble return (Dan Carpenter kick), 11:15. Bills 24–20. NYJ – Matt Forte 3-yard run (Nick Folk kick), 2:12. Jets 27–24. Drive: 12 plays, 84 yards, 6:27. NYJ – Nick Folk 36-yard field goal, 10:40. Jets 30–24. Drive: 8 plays, 69 yards, 4:12. NYJ – Matt Forte 12-yard run (Nick Folk kick), 4:02. Jets 37–24. Drive: 5 plays, 56 yards, 3:01. BUF – Mike Gillislee 18-yard pass from Tyrod Taylor (Dan Carpenter kick), 1:17. Jets 37–31. Drive: 10 plays, 75 yards, 2:45. The Jets broke their five-game losing streak against the Bills as well as their losing streak on Thursday Night Football. KC – Travis Kelce 12-yard pass from Alex Smith (Cairo Santos kick), 0:13. Chiefs 7–0. Drive: 4 plays, 35 yards, 2:11. KC – Cairo Santos 27-yard field goal, 6:11. Chiefs 10–0. Drive: 14 plays, 44 yards, 6:59. KC – Demetrius Harris 27-yard fumble return (Cairo Santos kick), 6:02. Chiefs 17–0. NYJ – Nick Folk 28-yard field goal, 2:06. Chiefs 17–3. Drive: 9 plays, 46 yards, 3:56. Ryan Fitzpatrick was benched midway through the 4th quarter in favor of Geno Smith as the Jets fell to 1–5 on the season. CLE – Andrew Hawkins 5-yard pass from Josh McCown (Cody Parkey kick), 11:45. Browns 7–0. Drive: 8 plays, 75 yards, 3:15. CLE – Cody Parkey 41-yard field goal, 3:11. Browns 10–0. Drive: 8 plays, 59 yards, 3:42. NYJ – Bilal Powell 35-yard run (Nick Folk kick), 12:44. Browns 10–7. Drive: 12 plays, 87 yards, 5:27. CLE – Cody Parkey 27-yard field goal, 0:00. Browns 20–7. Drive: 6 plays, 49 yards, 1:25. NYJ – Quincy Enunwa 24-yard pass from Ryan Fitzpatrick (Nick Folk kick), 8:15. Browns 20–14. Drive: 12 plays, 78 yards, 6:45. NYJ – Matt Forte 4-yard run (Nick Folk kick), 2:11. Jets 21–20. Drive: 8 plays, 84 yards, 3:03. NYJ – Matt Forte 2-yard run (Nick Folk kick), 9:38. Jets 28–20. Drive: 13 plays, 81 yards, 6:27. NYJ – Nick Folk 24-yard field goal, 4:04. Jets 31–20. Drive: 4 plays, 2 yards, 1:09. CLE – Andrew Hawkins 1-yard pass from Josh McCown (Josh McCown–Terrelle Pryor pass), 0:12. Jets 31–28. Drive: 14 plays, 84 yards, 3:52. ↑ Lange, Randy (January 6, 2016). "Three Jets Assistant Coaches Will Not Return". New York Jets. Archived from the original on January 10, 2016. Retrieved January 10, 2016. ↑ Lange, Randy (February 3, 2016). "Brant Boyer Named Special Teams Coordinator". New York Jets. Archived from the original on March 15, 2016. Retrieved March 15, 2016. ↑ Lange, Randy (February 5, 2016). "Jets Add ST Assistant Jeff Hammerschmidt". New York Jets. Archived from the original on March 15, 2016. Retrieved March 15, 2016. ↑ Lange, Randy (February 9, 2016). "Todd Bowles Fills Three Coaching Vacancies". New York Jets. Archived from the original on March 15, 2016. Retrieved March 15, 2016. ↑ Lange, Randy (January 5, 2016). "Jets Sign 9 to Reserve/Future Contracts". New York Jets. Archived from the original on January 10, 2016. Retrieved January 7, 2016. ↑ Lange, Randy (January 7, 2016). "Mangold to Play in His 7th Pro Bowl". New York Jets. Archived from the original on January 10, 2016. Retrieved January 9, 2016. ↑ Lange, Randy (January 11, 2016). "Jets Sign 4 More to Reserve/Future Contracts". New York Jets. Archived from the original on January 14, 2016. Retrieved January 14, 2016. ↑ Lange, Randy (January 12, 2016). "Jets Add WR/KR Chandler Worthy to Roster". New York Jets. Archived from the original on January 14, 2016. Retrieved January 14, 2016. ↑ Allen, Eric (January 19, 2016). "Hickey & Williams Sign Reserve/Future Contracts". New York Jets. Archived from the original on March 14, 2016. Retrieved March 14, 2016. ↑ Lange, Randy (January 28, 2016). "Jets Sign Titus Davis to Reserve/Future Deal". New York Jets. Archived from the original on March 14, 2016. Retrieved March 14, 2016. ↑ Lange, Randy (February 3, 2016). "Dri Archer Signs Reserve/Future Deal with Jets". New York Jets. Archived from the original on March 14, 2016. Retrieved March 14, 2016. ↑ Lange, Randy (February 5, 2016). "K Kyle Brindza Signs Reserve/Future Deal". New York Jets. Archived from the original on March 14, 2016. Retrieved March 14, 2016. ↑ Lange, Randy (February 16, 2016). "Jets Sign CFL Pass Rusher Freddie Bishop III". New York Jets. Archived from the original on March 14, 2016. Retrieved March 14, 2016. ↑ Allen, Eric (March 10, 2016). "Jets Sign RB Matt Forté". New York Jets. Archived from the original on March 15, 2016. Retrieved March 15, 2016. ↑ Lange, Randy (March 10, 2016). "Jets Backfield Adds Ex-Saint Khiry Robinson". New York Jets. Archived from the original on March 15, 2016. Retrieved March 15, 2016. ↑ Lange, Randy (March 21, 2016). "NT Steve McLendon Joins Jets' D-Line". New York Jets. Archived from the original on April 7, 2016. Retrieved April 7, 2016. ↑ Lange, Randy (March 25, 2016). "Jets Sign Former Texans CB Darryl Morris". New York Jets. Archived from the original on April 7, 2016. Retrieved April 7, 2016. ↑ Lange, Randy (March 30, 2016). "Jets Bring Aboard DE Jarvis Jenkins". New York Jets. Archived from the original on April 7, 2016. Retrieved April 7, 2016. ↑ Lange, Randy (April 4, 2016). "Bruce Carter Joins Jets' Linebacker Corps". New York Jets. Archived from the original on April 7, 2016. Retrieved April 7, 2016. ↑ Lange, Randy (April 8, 2016). "WR-KR Jeremy Ross Signs with Jets". New York Jets. Archived from the original on July 16, 2016. Retrieved July 16, 2016. ↑ Allen, Eric (April 20, 2016). "Jets Sign T Luke Marquardt". New York Jets. Archived from the original on July 16, 2016. Retrieved July 16, 2016. ↑ Allen, Eric (May 5, 2016). "Jets Sign 13 Undrafted Free Agents". New York Jets. Archived from the original on July 16, 2016. Retrieved July 16, 2016. 1 2 Allen, Eric (May 9, 2016). "Jets Sign CB Keeton, Waive TE Robinson". New York Jets. Archived from the original on July 16, 2016. Retrieved July 16, 2016. 1 2 Allen, Eric (May 9, 2016). "Jets Add TE Cunningham, Waive Archer". New York Jets. Archived from the original on July 16, 2016. Retrieved July 16, 2016. 1 2 Lange, Randy (May 24, 2016). "Jets Sign Undrafted RB Romar Morris". New York Jets. Archived from the original on July 16, 2016. Retrieved July 16, 2016. 1 2 Lange, Randy (June 1, 2016). "Jets Sign DE Harris, Waive DE Okoye". New York Jets. Archived from the original on July 16, 2016. Retrieved July 16, 2016. 1 2 "New York Jets Transactions - 2016". ESPN. Retrieved July 16, 2016. 1 2 Allen, Eric (June 17, 2016). "Jets Sign Kyle Williams, Waive Quenton Bundrage". New York Jets. Archived from the original on July 16, 2016. Retrieved July 16, 2016. 1 2 Allen, Eric (July 27, 2016). "Jets Sign RB Bernard Pierce, Waive Zac Stacy". New York Jets. Archived from the original on July 28, 2016. Retrieved July 27, 2016. 1 2 Lange, Randy (August 3, 2016). "Jets Sign Rookie RB Terry Williams". New York Jets. Archived from the original on August 17, 2016. Retrieved August 16, 2016. 1 2 Allen, Eric (August 4, 2016). "RB Moves: Jets Sign Tucker, Waive Williams". New York Jets. Archived from the original on August 17, 2016. Retrieved August 16, 2016. 1 2 Lange, Randy (August 6, 2016). "Jets Have Exchange of WRs on Roster". New York Jets. Archived from the original on August 17, 2016. Retrieved August 16, 2016. 1 2 Lange, Randy (August 8, 2016). "Jets Make Four Player Transactions". New York Jets. Archived from the original on August 17, 2016. Retrieved August 16, 2016. ↑ Lange, Randy (August 10, 2016). "Obioha Re-Signed, Placed on IR". New York Jets. Archived from the original on August 17, 2016. Retrieved August 16, 2016. 1 2 Lange, Randy (August 13, 2016). "Lache Seastrunk Joins Green & White Roster". New York Jets. Archived from the original on August 17, 2016. Retrieved August 16, 2016. 1 2 Lange, Randy (August 14, 2016). "Jets Sign RB Terry Willliams, DL Jake Ceresna". New York Jets. Archived from the original on August 17, 2016. Retrieved August 16, 2016. 1 2 Allen, Eric (August 16, 2016). "Jets Sign RB Antone Smith, Place Pierce on IR". New York Jets. Archived from the original on August 17, 2016. Retrieved August 16, 2016. 1 2 Lange, Randy (September 4, 2016). "4 Arrive via Waivers; RB Robinson Waived/Injured". New York Jets. Archived from the original on September 7, 2016. Retrieved September 6, 2016. ↑ Allen, Eric (September 6, 2016). "Jets Bring Back S Antonio Allen". New York Jets. Archived from the original on September 7, 2016. Retrieved September 6, 2016. ↑ Lange, Randy (February 18, 2016). "Kicker Kyle Brindza Waived After Achilles Tear". New York Jets. Archived from the original on March 15, 2016. Retrieved March 15, 2016. ↑ Lange, Randy (February 22, 2016). "Jets Release Cornerback Antonio Cromartie". New York Jets. Archived from the original on March 14, 2016. Retrieved March 14, 2016. ↑ Lange, Randy (March 9, 2016). "Jeremy Kerley, Jeff Cumberland Released". New York Jets. Archived from the original on March 14, 2016. Retrieved March 14, 2016. ↑ Bailey, Stephen (May 7, 2016). "Former Syracuse football OL Sean Hickey released by New York Jets". Syracuse.com. Retrieved July 16, 2016. ↑ Lange, Randy (July 28, 2016). "With Fitz Signing, P Tom Hackett Is Waived". New York Jets. Archived from the original on July 28, 2016. Retrieved July 28, 2016. ↑ Allen, Eric (August 20, 2016). "Jets Release RB Bernard Pierce". New York Jets. Archived from the original on August 29, 2016. Retrieved August 28, 2016. ↑ Allen, Eric (August 28, 2016). "Jets Release 11, Place Devin Smith on PUP List". New York Jets. Archived from the original on August 29, 2016. Retrieved August 28, 2016. ↑ Allen, Eric (August 30, 2016). "Jets Reach 75, Waived/Injured 3 Players". New York Jets. Archived from the original on September 7, 2016. Retrieved August 30, 2016. ↑ Lange, Randy (September 3, 2016). "Jets Release 18 Players Ahead of Deadline". New York Jets. Archived from the original on September 7, 2016. Retrieved September 6, 2016. ↑ Allen, Eric (September 3, 2016). "Amaro Waived, Milliner Waived/Injured". New York Jets. Archived from the original on September 7, 2016. Retrieved September 6, 2016. ↑ Hughes, Connor (September 6, 2016). "Jets sign safety Antonio Allen, reach injury settlement with Trevor Reilly". NJ.com. Archived from the original on September 7, 2016. Retrieved September 6, 2016. 1 2 Allen, Eric (September 6, 2016). "Two DBs, Two RBs Signed to Practice Squad". New York Jets. Archived from the original on September 7, 2016. Retrieved September 6, 2016. ↑ Allen, Eric (September 13, 2016). "Jets Waive TE Braedon Bowman". New York Jets. Retrieved September 14, 2016. ↑ Lange, Randy. "Jets Waive FB Julian Howsare". NewYorkJets.com. ↑ Lange, Randy (April 10, 2016). "Jets Trade with Broncos for T Ryan Clady". New York Jets. Archived from the original on September 7, 2016. Retrieved September 6, 2016. ↑ Lange, Randy (September 4, 2016). "Jets Sign 6 to Their Practice Squad". New York Jets. Archived from the original on September 7, 2016. Retrieved September 6, 2016. ↑ Allen, Eric (September 12, 2016). "Jets Make 4 Practice Squad Moves". New York Jets. Retrieved September 20, 2016. ↑ Allen, Eric (September 19, 2016). "Jets Sign TE Bowman to Practice Squad". New York Jets. Retrieved September 20, 2016. ↑ "Texans sign safety Antonio Allen". Houston Texans. March 16, 2016. Archived from the original on April 7, 2016. Retrieved April 7, 2016. ↑ Patra, Kevin (June 1, 2016). "Ex-Redskins DE Stephen Bowen retires from NFL". National Football League. Archived from the original on July 16, 2016. Retrieved July 16, 2016. ↑ Orr, Conor (August 22, 2016). "Giants sign kicker Randy Bullock to one-year deal". National Football League. Archived from the original on September 7, 2016. Retrieved September 6, 2016. ↑ Cabot, Mary Kay (March 16, 2016). "LB Demario Davis signs 2-year, $8 million deal with Browns; is expected to start". Cleveland.com. Archived from the original on April 7, 2016. Retrieved April 7, 2016. ↑ Lange, Randy (March 14, 2016). "TE Kellen Davis Re-Signs with Green & White". New York Jets. Archived from the original on March 14, 2016. Retrieved March 14, 2016. ↑ Brown, Chris (June 13, 2016). "Bills sign DL Douzable, OT Martin". Buffalo Bills. Archived from the original on July 16, 2016. Retrieved July 16, 2016. ↑ Allen, Eric (July 28, 2016). "It's Official: Jets Re-Sign QB Ryan Fitzpatrick". New York Jets. Archived from the original on July 28, 2016. Retrieved July 28, 2016. ↑ Young, Shalise Manza (March 9, 2016). "Giants take Jets' Snacks, signing Damon Harrison to anchor D-line". Yahoo! Sports. Archived from the original on March 14, 2016. Retrieved March 14, 2016. ↑ Lange, Randy (March 24, 2016). "Erin Henderson Returns to the Jets D". New York Jets. Archived from the original on April 7, 2016. Retrieved April 7, 2016. ↑ Lange, Randy (April 14, 2016). "T Ben Ijalana Re-Signs with the Jets". New York Jets. Archived from the original on July 16, 2016. Retrieved July 16, 2016. ↑ Oehser, John (March 10, 2016). "Chris Ivory: "The place for me"". Jacksonville Jaguars. Archived from the original on March 15, 2016. Retrieved March 14, 2016. ↑ "Bills sign LB Jamari Lattimore". Buffalo Bills. May 31, 2016. Archived from the original on July 16, 2016. Retrieved July 16, 2016. ↑ Allen, Eric (March 16, 2016). "Bilal Powell Re-Signs with Jets". New York Jets. Archived from the original on April 7, 2016. Retrieved April 7, 2016. ↑ Zangaro, Dave (April 18, 2016). "Eagles Sign Punter Ryan Quigley to 1-Year Deal". CSN Philly. Archived from the original on July 16, 2016. Retrieved July 16, 2016. ↑ "Lions sign free agent RB Stevan Ridley". Detroit Lions. April 5, 2016. Archived from the original on April 7, 2016. Retrieved April 7, 2016. ↑ Allen, Eric (March 10, 2016). "Jets Sign Sudfeld, Extend Tender to Thompkins". New York Jets. Archived from the original on March 14, 2016. Retrieved March 14, 2016. ↑ Waszak Jr., Dennis (March 14, 2016). "AP sources: Jets re-sign Davis; Thompkins signs tender". Associated Press. Archived from the original on March 15, 2016. Retrieved March 15, 2016. ↑ "Lions sign unrestricted free agent CB Darrin Walls". Detroit Lions. March 29, 2016. Archived from the original on April 7, 2016. Retrieved April 7, 2016. ↑ Sessler, Marc (July 15, 2016). "Muhammad Wilkerson signs five-year deal with Jets". National Football League. Archived from the original on July 16, 2016. Retrieved July 16, 2016. ↑ "Jets Trade Up, Take T Brandon Shell in Round 5". www.newyorkjets.com. Retrieved 2016-04-30. 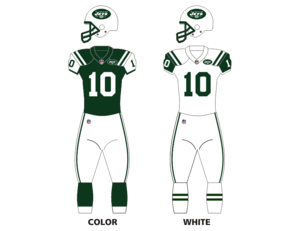 Wikimedia Commons has media related to 2016 New York Jets season.